Ralston went on to say that sequestration was likely to mean a $240-million hit to Georgia’s FY2014 budget, particularly in Title I education and special education funding. Additionally, cuts to the military could hit places like Warner Robins and Columbus especially hard. Ethics Reform: Georgia’s voters, Democrats and Republicans, made it pretty clear via referenda on both parties’ primary ballots last summer that they were tired of business as usual under the Gold Dome, particularly free meals and trips and tickets from lobbyists to lawmakers. And 2013 will likely go down as the year something got done. After several failed attempts in several years, Georgia seems on its way to a more ethical future. In late February, the Georgia House of Representatives passed what Speaker David Ralston called “real ethics reform,” with bipartisan support. The Senate, at press time, was considering its own ethics measure. DeKalb School Daze: When Gov. 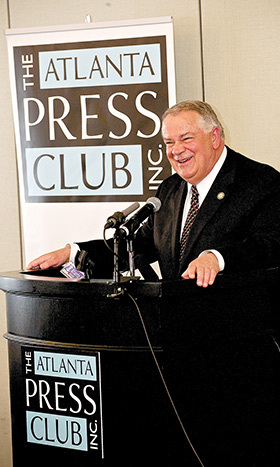 Nathan Deal announced that he would accept the unanimous recommendation of the state Board of Education and suspend six members of the DeKalb County School Board, he was flanked by a group of state lawmakers, including House Minority Leader Rep. Stacey Abrams (D-Atlanta), Democratic DeKalb Reps. Mary Margaret Oliver and Scott Holcomb, Sens. Fran Millar (R-Atlanta) and Emanuel Jones (D-Decatur). The DeKalb system has been put on probation by the Southern Association of Colleges and Schools, or SACS, which accredits Georgia’s public high schools. The action came with a scathing report that paints a picture of a dysfunctional board that meddled in personnel decisions and bus routes but failed to provide essential budget oversight, among other things. At a town hall meeting in Brook-haven the same day the governor announced his decision, Holcomb said DeKalb is currently the only school system in the country that is on probation because of poor board governance. All members of the DeKalb School Board – old or new – will be up for re-election in 2014, courtesy of a state law that requires the number of board members to be reduced to seven. Ranking Republican: U.S. Sen. Johnny Isakson, from Marietta, is now the ranking Republican for the Senate Subcommittee on International Trade, Customs and Global Competitiveness, under the Senate Committee on Finance. The subcommittee deals with trade and U.S. competitiveness in world commerce. Isakson is a strong supporter of the push to deepen the Port of Savannah, and his leadership position on the subcommittee is seen as a plus for that project. High Scores: U.S. Rep. Tom Graves, a Republican who represents Georgia’s District 14, got an A+ from Americans for Prosperity Georgia, which identifies itself as “the state’s premier free market grassroots organization” for his votes during the 112th Congress. Five of his fellow Republican representatives from Georgia earned an A: District 10’s Paul Broun, District 11’s Phil Gingrey, District 8’s Austin Scott, District 6’s Tom Price and District 3’s Lynn Westmoreland. The highest grade among Democrats – a C – went to Rep. John Barrow of District 12. Manufacturing Award: Congressman Phil Gingrey was honored by the National Association of Manufacturers with its Award for Manufacturing Legislative Excellence. He supported 91 percent of the policies considered critical by the NAM during the 112th Congress. More Cities? Talk at a recent Town Hall Meeting sponsored by Rep. Scott Holcomb indicated there is strong interest in cityhood and/or annexation. A citizen study group is actively evaluating the idea of a city called Lakeside, near the Northlake area in northern DeKalb, and other areas are expressing interest, too.